Persie forces driven oot o Greece for 10 years. 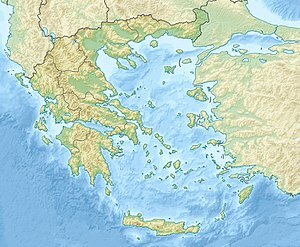 The Battle o Marathon (Greek: Μάχη τοῦ Μαραθῶνος, Machē tou Marathōnos) teuk place in 490 BC, during the first Persie invasion o Greece. It wis focht atween the ceetizens o Athens, aidit bi Plataea, an a Persie force commandit bi Datis an Artaphernes. The battle wis the culmination o the first attempt bi Persie, unner Keeng Darius I, tae subjugate Greece. The Greek airmy decisively defeatit the mair numerous Persies, merkin a turnin pynt in the Greco-Persie Wars. This page wis last eeditit on 5 Mairch 2018, at 06:56.